Would Unrealistic Field Guides Be Useful? Debates about new field guides these days usually focus on whether the book uses illustration or photographs. There is agreement, as far as I'm concerned, on the strengths and weaknesses of both strategies. Photographs do a better job showing how birds actually appear in the field but are difficult to obtain (the new Crossley ID guides take a very thoughtful approach). Illustrations look less "realistic" by virtue of the fact that they are artistic creations, but they are much more easily manipulated to show different plumages and for comparisons. Though illustrations are representations, it seems that the one constant for both types of field guides is the quest for realism. This make total sense, of course: if you want to help people recognize the birds around them you'd want your images to look like the birds. More than that, the subtle differences between many species mean that the more realistic the representations in a field guide, the better the user will be able to make the correct ID. Part of me wonders, though, whether there is a point that increased realism comes at the expense of usefulness in learning. I use field guides in two ways: for study and for reference. I study the guides to learn about the birds, the goal being to bring the knowledge into the field and use it to ID birds without further consultation from the guide. I reference a field guide when I can't remember something, like whether it's the Sharp-shinned or the Cooper's Hawk with the squared-off tail. Even my earliest days of birding I studied the guide much more than I referenced it. I knew that for all good birders, birding in the field was a closed-book exam - when one talks about the "skill" of a birder they're usually talking about the ability to identify quickly and without consultation. If I wanted to be a good birder I had to learn the birds and remember them. Increasingly realistic imagery isn't the only strategy for the study (i.e. learning and retention) of birds, but it is the only one (visually, that is) used in any of the field guides I know of. Would unrealistic imagery help? I'm thinking that if a birds' colors were shown in with more contrast or the diagnostic features of its structure exaggerated, it might serve as a memory trigger when the species is seen in the field, like some kind of visual mnemonic device. To help make my point I've made a series of crappy drawing of raptor heads. PLEASE DON'T LAUGH AT THEM I KNOW THEY'RE NOT GOOD. These images clearly show a limited set of plumages (and these raptors might not, in retrospect, have provided the best example), but simplifying the birds' features (i.e. 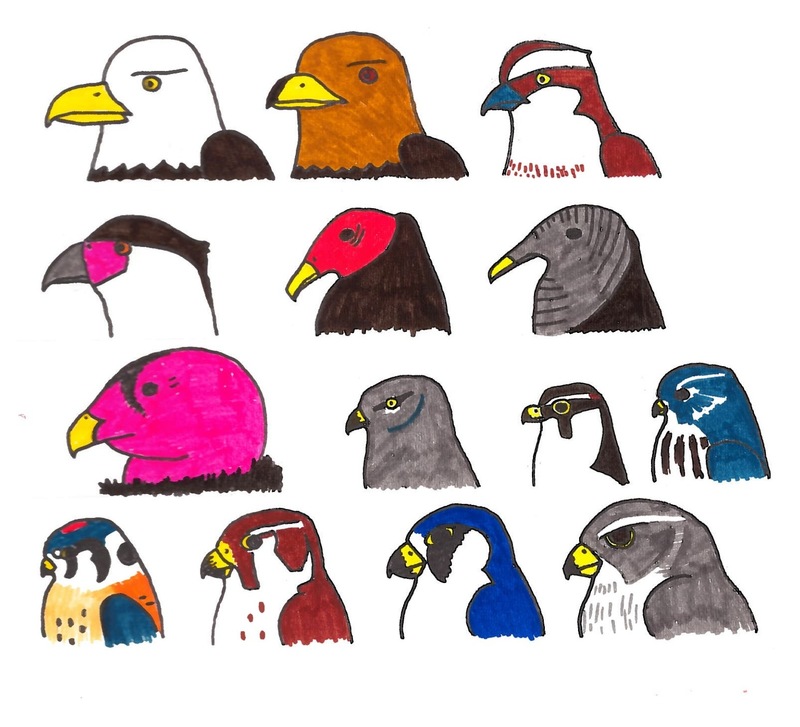 falcon facial patterns) and exaggerating the colors could help in identifying the birds later on. Yes! You could seriously have an accompanying 'colouring' book, workbook kind of thing to go along with an id guide. I remember things better if I have to write them down. I think I will try that with a nice new set of pencil crayons! And you are right, the realism distracts my attention from diagnostic field marks, like a 'big' eye, for example. But the photo guides are getting better in these regards. I definitely prefer a plain white background, rather than a photo of habitat. Thanks for presenting your ideas! I believe David Sibley used the approach you are discussing. Robert- I love Sibley's guides and think they are the best out there for study, I had in mind something even more simplified (as in, block colors and no feathering except where necessary for ID) and exaggerated than his are, for the sake of memory and learning.